Over half of all Russians agree that an opposition is a necessary part of the political system, but very few agreed with the current demands of opposition politicians or said that they would like to see those people in power one day. 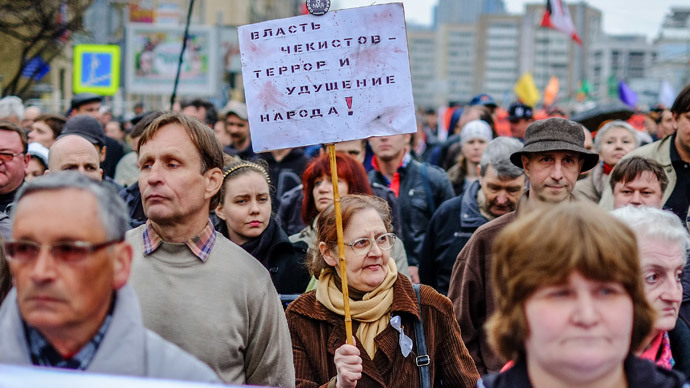 According to the latest research by independent pollster Levada Center, the proportion of Russians who agreed with the statement that an opposition is a necessary part of the political system was 58 percent. At the same time, only 19 percent of respondents said an opposition was necessary to ensure the timely replacement of state authorities. Some 22 percent of respondents opposed the very existence of opposition movements in the country, saying it only atomizes the community by causing unnecessary conflicts. In addition, most who hold that view see all such efforts as futile - only 15 percent said they thought that opposition activities were obstructing the authorities’ work aimed at solving the problems that stand before the society. Politicians that are considered ‘non-system opposition’ claimed even fewer supporters – only 3 percent of those polled said they sympathized with persons from the Solidarity Coalition and a further 12 percent said they sympathized with some parts of the Solidarity agenda. It should be noted, that the term ‘non-system’ was used more due to inertia of public perception as most of the personalities behind the coalition – such as Boris Nemtsov or Aleksey Navalny – already have registered political parties and participate in elections. Levada Deputy Head Aleksey Grazhdankin said in comments to Kommersant that the current state of public mood could be explained by the absence of genuine opposition in the country and the great effort of the authorities to discredit any dissent in the eyes of the broader public. However, he did not delve into defining a ‘real’ opposition and pointing out its differences from projects that currently bear this name in Russian politics. In the same poll, Levada asked the public about their attitude to the slogans proposed for the forthcoming major opposition event – the ‘Spring March’ scheduled for March 1. The most popular ideas were “passing laws against illegal enrichment of civil servants” with 32 percent of supporters and “ensuring the fairness of elections” with 30 percent. The ‘Stopping the war in Ukraine’ slogan claimed 18 percent of supporters. Other demands garnered almost negligible support. The call to cancel the alleged censorship in mass media was shared by only 5 percent of Russian citizens, and “decentralization of power” and “release of all political prisoners” claimed 2 percent of supporters each. However, one of the organizers of the rally, Leonid Volkov, explained the lack of support by the fact that the slogans had been developed on the basis of requests of those who regularly attend protest rallies rather than the broad public.